Ness Botanic Gardens are situated near the Welsh and the English border and is near the city of Chester. The place occupies 64 acres overlooking the Dee estuary. The place is a grade II park in the National Register of Historic Parks and Gardens. 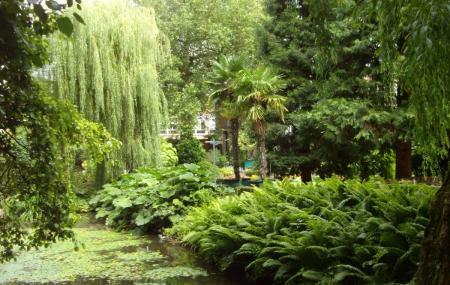 The garden’s beautiful and rare flora and fauna is what attracts tourists from far off places. The garden has many specimens of trees and gardens and snow drop walks are a main attraction in the place. Children under 5 – free entry. Children 5-16 old-3.85 British Pounds. Family ticket 22 British Pounds. Prices mentioned are for Gift aid visitor. You can take a bus from Neston Road Turning Circle (cnr) station. How popular is Ness Botanic Gardens? People normally club together Anfield and Chester Cathedral while planning their visit to Ness Botanic Gardens. Disabled not welcome? Was looking forward to a visit here. Friend rang to be told they no longer provide mobility scooters for disabled visitors. I am only able to walk a very short distance, so we went elsewhere. Why would they choose to make the place less accessible than it previously was! Gardens are nice, weren't very colourful though, visited April. Paths stated as wheelchair friendly were mainly gravelled, so hard going in places. The whole place looked 'shutdown' personally thought it was overpriced. Coffee shop nice and spaceous. A great range of things to do and see here throughout the year. Today we were visiting the cafe for some festive treats. The staff were helpful and the service was great as always, a lot of the food is locally sourced and cooked to such a high standard and the prices are really reasonable. Lovely to walk off you dinner in the gardens afterwards. I am absolutely disgusted when my friend tried to visit the other day he was refused entry. my friend is totally paralysed from the neck down and needs carers 24/7. he was told that he had to prove that he needed the carers so that they could gain entry. it is obvious by looking at him he is totally paralyzed and needs the carers. the way he has been treated is an absolute disgrace. he was looking forward to a day out, and had his carers drive him from Leigh to visit. you are an absolute disgrace and you should be ashamed of yourselfs. regards Ian .